Spring weather always keeps us guessing. Will it get warmer today so I can open the windows or will I have to bring in more wood for the furnace? Can I go take pictures outside or will the wind make that a useless adventure? Besides the Spring rains there are always some freak winds that come up the valley or across the mountains that ends up toppling a few trees here and there. The night of the 17th was terribly windy with some real gusts. Not sure how strong as far as miles per hour, but the trees were really swaying. The wind gusts made a wild noise sweeping through the trees. It was eerily quiet in between the gusts. I was at Little Buffalo State Park the next morning and wasn’t too surprised to run into a DCNR employee with a chainsaw in hand. I got a few pictures of a rather large white pine that was taken down by some stiff wind. 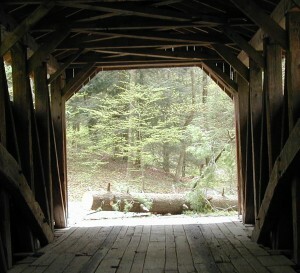 We’re very lucky that more damage wasn’t inflicted on the Clay Covered Bridge. Maybe a few shingles were lost, but the damage could have been a lot worse! Toppled tree at the end of Clay Covered Bridge. White pine toppled by wind gust. Tree rings of large white pine tree. This white pine was at least 55 years old. 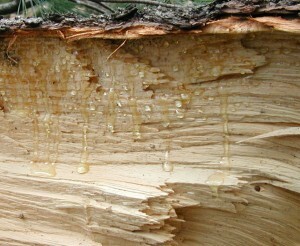 Sap is flowing from the outer rings of wood on this felled white pine tree. The sapwood released its watery contents in the areas that were damaged. When the tree was felled and cut, its vessels that transport water and nutrients were broken, and so, the sap bled out of the wood. Felled white pine tree just misses the Clay Bridge. Nice straight trunk, maybe nice enough to be sold for board content. 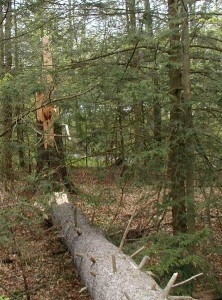 In our woods we see trees that are damaged by weather every year. Some are just old trees, but others were probably damaged first by insects and then brought down by the wind. One of my favorite trees bloomed beautifully this year. The weather cooperated to stay chilly during the blooming period for the Eastern Redbud, Cercis canadensis. The redbud is native to the eastern US and as the Peterson Eastern Trees Guide tells us, Central Pennsylvania is the redbud’s northern-most limit. I delight at seeing the redbuds each spring at the edge of the woods, peaking out with their rosy purple blossoms. Perhaps its the time of year – Happy Spring. Redbud flowers arise directly from the stems. From a distance the blossoms appear to follow the lines of the tree. The result is a purple outline of many of the tree’s branches. Nice thin lines. I think the redbud was probably the tree that made me realize that wild trees flower and can be beautiful doing so. 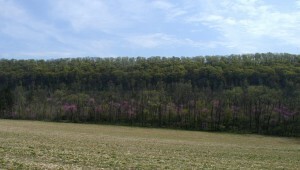 The flowering redbuds stand out where the corn field meets the woods at the base of the ridge. I look for them every Spring, but I’m sure that quite a few people zip down the highway without noticing them. Sad, don’t you think? Stop and smell the roses, people! 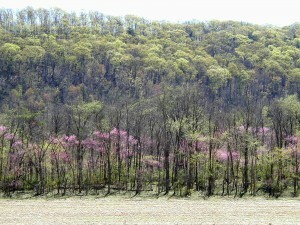 Redbud trees blooming at the woods edge. Photo taken 10Apr2010. The redbuds flowered from at least the 10th, and probably a couple days before that, through the 23rd of April when some trees were noticed with leaves coming out. Rain on 24-25 April probably took down a lot of spring tree blossoms. It’s hard to pin down the flowering times or blooming times of spring flowers. From year to year differences in weather patterns will dictate the blooming times of at least some of the Spring ephemerals. We live in the Ridge and Valley Province of Pennsylvania, where you can change elevation in a matter of feet. Since elevation plays a role in temperature, it will also play a role in blooming times. From certain vantage points you can watch the tree leaves emerge in turn as you go up the mountain. In town, which is some 200 feet below our place on the ridge, plants can flower a week ahead of ours…forsythia, dogwood, azalea are examples from the past couple of weeks. One of the earliest blooming Spring Ephemeral flowers is Bloodroot, Sanguinaria canadensis. The days are often cold and windy at the time of year when the bloodroot blooms, but once the sun shines long enough to warm the ground bloodroot will emerge. 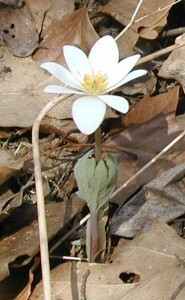 Bloodroot grows in eastern forests, especially moist soils in wooded areas. 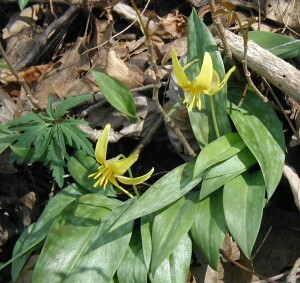 The Mill Race Trail at Little Buffalo State Park, Newport, Pennsylvania, is a great place to see this perennial spring flower blooming in early April. 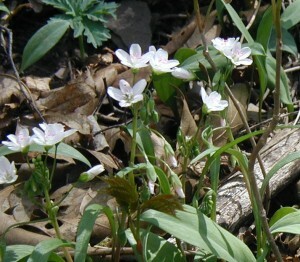 A group of bloodroot flowers in the woodlands. The flowers arise from an underground rhizome in a bud fashion. If you looking for bloodroot on the early side, you might see a few flowers still curled up tight before the blossoms open. Bloodroot flower emerges as a tight bud. In the image above you can see the leaf curled around the flower stem below the small white flower bud. 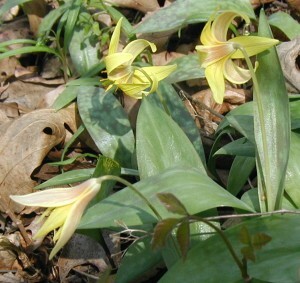 The sword-like mottled leaves next to the bloodroot are trout lilies that had yet to bloom. As bloodroot grows the flower stem continues to elongate and the flower opens up. 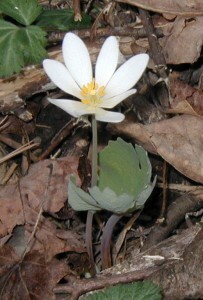 The leaf of bloodroot is still wrapped around the flower stem while the flower is blooming. Bloodroot flower opening. Note leaf curled around flower stem. Once the petals of the bloodroot flower start to open you’ll be able to see the large canary yellow stamens. As the bloodroot flower matures the leaf also continues to develop and pull away from the flower stem. It would be cool to see bloodroot flowers under a UV light – I wonder if the gray lines on the white petals would light up to show the pollinators where to find the pollen. You have to inspect the flower really closely to see these lines, which are barely visible in bright sunlight. 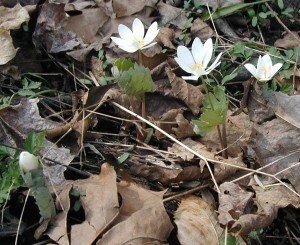 Bloodroot is considered a Spring Ephemeral, flowering only for a brief time in early spring before the trees leaf out. If you get into the woods after the tree leaves emerge, you probably won’t find any bloodroot still blooming. 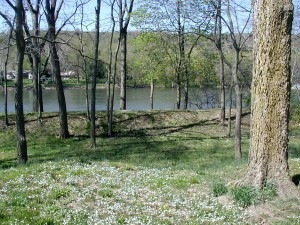 Bloodroot blooms for about a week, depending on the weather in early Spring. Here in Southcentral PA we see bloodroot the first or second week of April. Bloodroot flowers have eight to ten, white, elongated petals that seem to be attached rather loosely. Any attempts at picking the flower or digging one up will result in the loss of petals. That’s probably why we don’t see bloodroot at garden centers. They’re too delicate for any handling and would never look good in flower arrangements because of that. 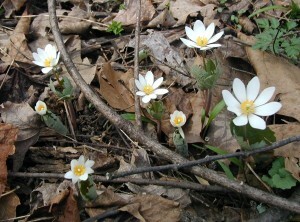 The flowers of bloodroot should be appreciated in their natural habitat or perhaps in a native plants garden. 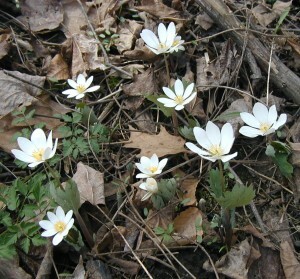 Bloodroot flowers in the forest in early April. Closer inspection of the flower shows that it comes up first, followed by a single leaf for each flower. 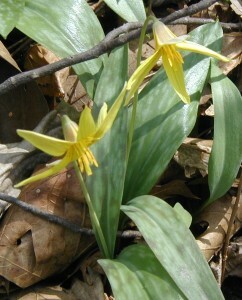 The leaves emerge curled around the flower stem. After the flower has bloomed and lost its petals, the leaf will grow in earnest. 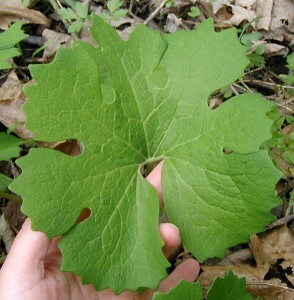 The large round leaf of bloodroot is a unique one with a deeply scalloped edge. 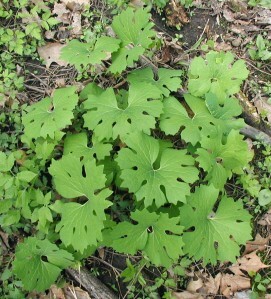 In the image below there are about 16 bloodroot leaves. Bloodroot leaves after the flower is gone. Some of the leaves will get pretty large – as big as your hand, or 8 to 10 inches across. No two leaves seem to have the same exact design, although they all have 7-10 deeply cut lobes each of which are scalloped or have deep, rounded notches. Bloodroot leaf with scalloped edge and rounded lobes. Peeking underneath the leaves you can see the seed pods forming from the old flower. 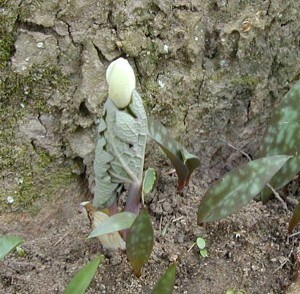 Seedpods under the leaves of bloodroot. 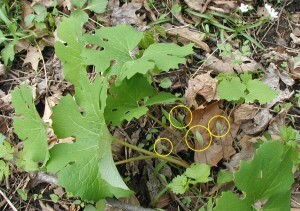 Bloodroot seedpods are circled in yellow in the image above. (Click on photo for larger image.) Eventually, the flower stem will bend down to the ground where the seedpod can release its contents. The bloodroot plant disappears, or cycles back to the earth, in summer. Bloodroot is named for the red juice that bleeds out from a cut or damaged root. The root itself is an orange-red color. 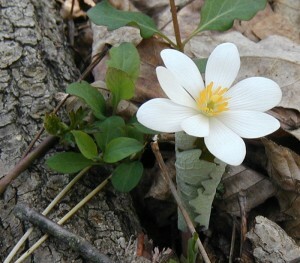 Native Americans used bloodroot as a dye and to decorate their skin. If you rub the juice on your skin it will last a few days. Peterson’s Medicinal Plants Guide tells us that, historically, bloodroot was used in the form of a root tea to treat coughs, laryngitis, asthma, bronchitis, lung ailments and rheumatism. CAUTION – bloodroot is toxic – do not ingest. A component in bloodroot, sanguinarine, has been shown to have antiseptic, anesthetic and anticancer activity. Today, it is used in commercial mouthwash and toothpastes as a plaque-inhibiting agent. Went to drop off the car at the local garage a couple weeks ago for its annual inspection. The garage is located on a “river road” that travels along the Juniata River in Perry County, PA.
On Saturday, 3Apr2010, I had reason to travel the same river road (on my way to Little Buffalo State Park in Newport, PA) and it was then that I first spied these massive groupings of Dutchman’s Breeches. 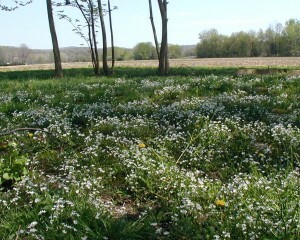 Until then I had not seen such a large grouping of these curious Spring ephemeral flowers. 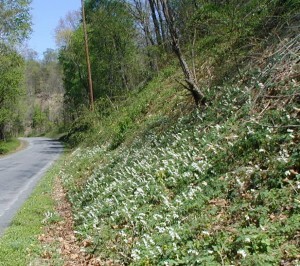 Dutchman’s Breeches, Dicentra cucullaria, were blooming in mass quantities on high stone outcroppings and along the roadside. 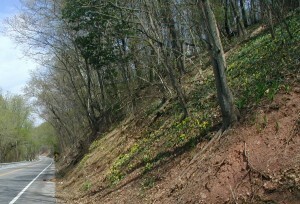 The stoney hillside coming up from the river bank is gradual in slope on the river side of the road, but once you cross the road the stone rises more vertical, making small cliffs in a couple areas that are probably 30 to 50 ft. tall. 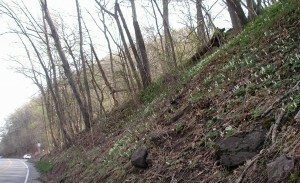 Dutchmen's breeches blooming on the hillside. 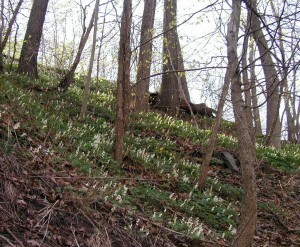 The Dutchman’s Breeches were in full bloom and really shone white in the sunlight. As we passed by them in the car you could easily see the white blossoms on their flower spike hanging above the plant greenery. Flower stalks of dutchmen's britches. 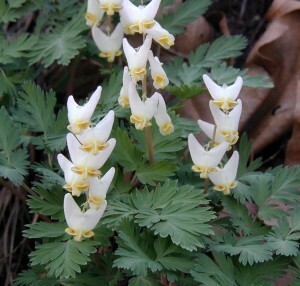 Dutchman’s Breeches have all their flowers in a row going up a curved flower stalk, in the manner of the old time garden favorite Bleeding Hearts, Dicentra spectabilis, a close relative of Dutchman’s Breeches. Comparing one to the other you can see similarities in the way the flowers hang from their flower stems. While the Bleeding Hearts dangle down from their flower stem, the Dutchman’s Breeches appear to be hanging on the clothesline with their feet up! Note the highly divided, feathery leaves. This closeup image shows the “pantaloons” hanging from the flower stalk. 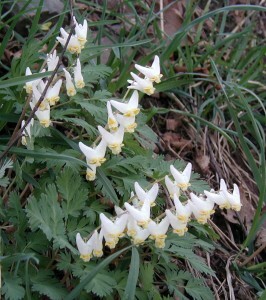 The unique flower of Dutchman’s Breeches makes identification a simple matter. No other flower looks quite like a hanging pantaloon. Another related plant, called Squirrel Corn, Dicentra canadensis, has a similar flower, but instead of two “legs” sticking up it’s blossom has a rounded end that makes it look like a kernel of corn. We’ve seen Dutchman’s Breeches blooming from the 3rd to the 18th of April this year, so there’s at least a two week time period to observe their flowers, which is kind of long for a Spring ephemeral. Once you know what they look like, they’re easily noticed – even while driving by at highway speeds – by their flowers on the upright flower stalks. 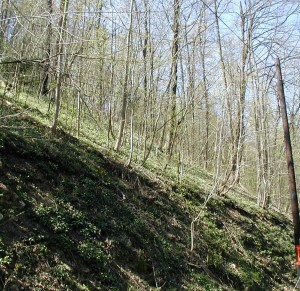 Apparently, Dutchman’s Breeches prefer a wooded, hillside habitat. We’ve seen several areas with mass groupings of them and all were on a slope in wooded areas. 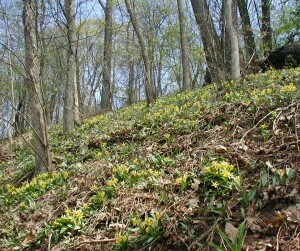 Dutchman's breeches blooming on a east-facing hillside. 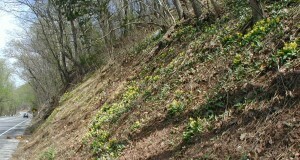 Dutchman's breeches blooming on a west-facing hillside. 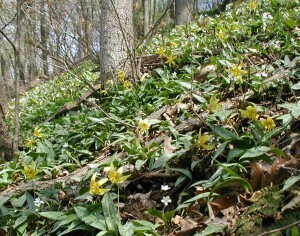 Blooming on the same west-facing slope were Dogtooth Violet or Trout Lily, Cut-Leaved Toothwort and Spring Beauty. This slightly shaded, moist area next to the river was still receiving runoff as we saw some water flowing down the rocks to the river. 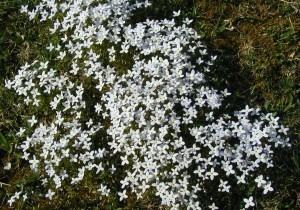 A dainty little flower that can truly be appreciated from afar is called Bluets, Houstonia caerulea. You never see just one Bluet, so I guess that’s why they’re called Bluets. 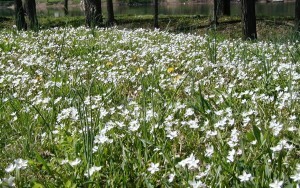 Bluets are perennials that have the ability to form large colonies. It is this ability that will probably draw your attention to this tiny little plant. 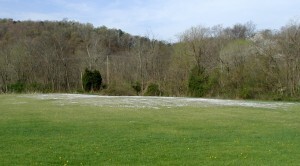 The Bluets colony in this field can be seen from afar. 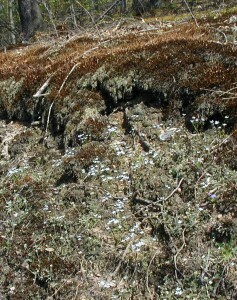 Light blue flowers form a great big colony in the field in the image above. The flowers stand taller than the surrounding grass, which was very short, and so appeared as a great big patch of light blue color in the field. 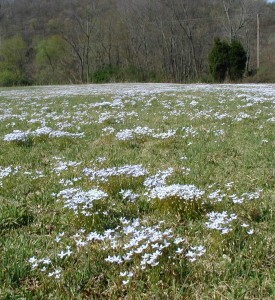 Bluets flowers colonize a grassy field. Open areas, grassy fields and yards are likely areas to find Bluets, but they can occur in other open areas. 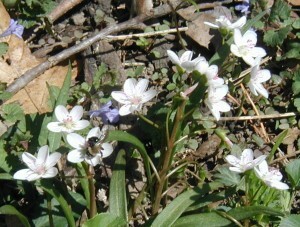 Below, a small group of Bluets were found growing on a wooded bank along a country road. 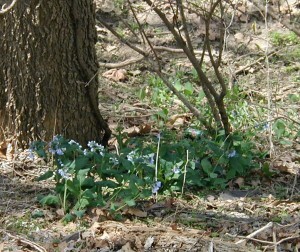 A small grouping of bluets on a wooded hillside. 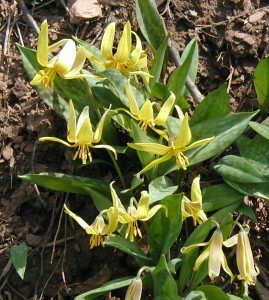 Four-petaled flowers are held upright on a thin stem, 2 to 8 inches high. Light blue to white petals surround a yellow ring in the center of the flower. Petals are pointed and the flowers look rather symmetrical. Bluets are four-petaled flowers in light blue with yellow centers. Leaves are smaller than the blossoms. 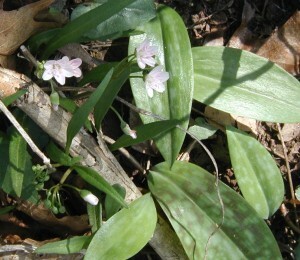 Very thin and short, the leaves are paired on the flower stems which have a few larger basal leaves. 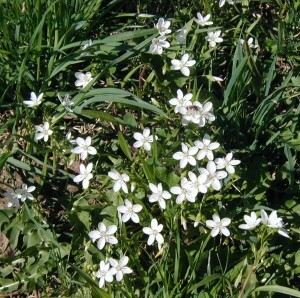 The Houstonia genus is represented by 20 species in our area, but distinguishing them requires examination of the flowers, fruit and seed shape. Microscopy must be used to see fine seed detail in order to identify Bluets to the species level. Exact identification would require collection of fruits and seeds and further examination. In general, we can just refer to these cute little flowers as Bluets. According to Peterson’s Medicinal Plants Guide Native Americans used a leaf tea for bed-wetting. No other use is mentioned and apparently Bluets aren’t edible, so I guess we’ll just have to appreciate the little Bluets smiling in the millions from afar.